The final bastion of steam in NSW would be the Hunter Valley coalfields. With increasing tonnages of coal to be transported, the NSWGR required a class of branchline locomotives capable of treading lightly on some of the more unfriendly colliery branch lines in the region. While modern coal trains are hauled by the heaviest power in the state, this was not always the case, with lightly laid track and short trains calling for a different approach. Supplied by A. Goninan and Co Pty Ltd in Broadmeadow, the twenty members of the 47 Class were initially put to use hauling coal trains on the lightly laid branch lines of the Hunter Valley. The locomotives were an immediate hit with crews, with their roomy cabs and good visibility, especially when compared with the other branchline classes. The class did not prove to be as popular with management however, with initial problems including engine overheating and electrical problems (associated with the Hitachi electrical components) causing numerous failures – at least half of the class was out of service during as 1973, resulting in most locomotives being returned to Goninan’s Broadmeadow plant for work. Despite the class being ordered to work on the coal branch lines of the Hunter Valley, initial deliveries of the class were made to Bathurst. Whilst this move was welcomed by crews and enthusiasts alike, the locomotives overheating problems were quickly exacerbated by the hot western summers. These problems persisted, resulting in electrical fires to 4706 and 4717 during 1974. 4709 also suffered an electrical fire in 1974 whilst banking a train on Tumulla Bank, near Bathurst. The damage was bad enough that the unit was withdrawn from service at only sixteen months of age! Moved to Cardiff Workshops in 1977 with classmate 4710 (having suffered accident damage between Parkes and Bogan Gate in March of that year), both locomotives were stripped of useful parts and scrapped in April 1979. 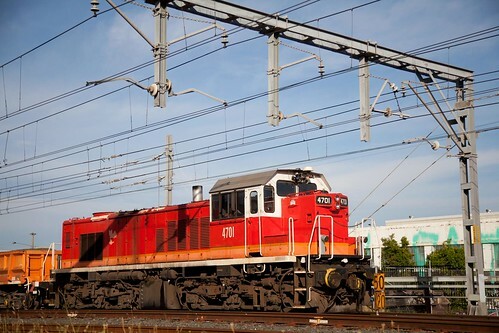 The class would be transferred from the Western Division to Broadmeadow by 1981 to be used on the coal roads – the task that they were originally designed for. Despite this, the class occasionally escaped the Newcastle area, being sent to locations including Ulan, Moree, Armidale and Martins Creek. During times of drought, the class was always one of the first to be stored, as the initial problems that plagued the class never really went away, however they were always reactivated when the rains came and traffic increased. By 1990, the class had fallen out of favour again, with locomotives set aside as each failure occurred. The class was finally withdrawn from government service on New Year’s Eve, 1990 when 4705 and 4706 worked a trip train in the Newcastle area, after which the locos were stopped. Special mention must be made of the fate of 4719. As the 47 Class had very strong frames, it was not unusual for the units to be used on bank engine duties in the western and north-western areas of the state. As train loads lengthened and became heavier, there were concerns that the Dynamometer Car (a former MHO van) used by the railways would not be strong enough to be used for locomotive testing on heavy coal trains. 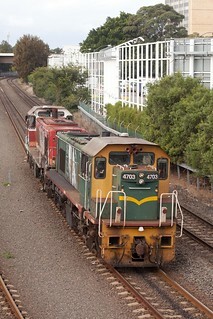 Thus, 4719 (which had been stored in Bathurst Workshops, out of service). The engine was removed (replaced with scrap metal to provide ballast), along with the redundant traction motors and other electrical components. The cab from 4715 (which had been stored at Cardiff Workshops) was placed at the end of the long hood. A diesel generator was also fitted to the unit to power the testing equipment. Although the vehicle was later withdrawn from service, it was purchased by Lachlan Valley Railway, and is stored at Cowra. Perhaps owing to their colourful career in government service, the 47 Class locomotives were not as readily accepted by the private sector. A large number of the class were saved from scrap by Lachlan Valley Railway (LVR), at Cowra. Initially, the class were purchased for use on a freight venture, hauling wheat from the Cowra area, although this did not prove to be viable in the long term, with the lines radiating out from Cowra all succumbing to closure by ARTC. 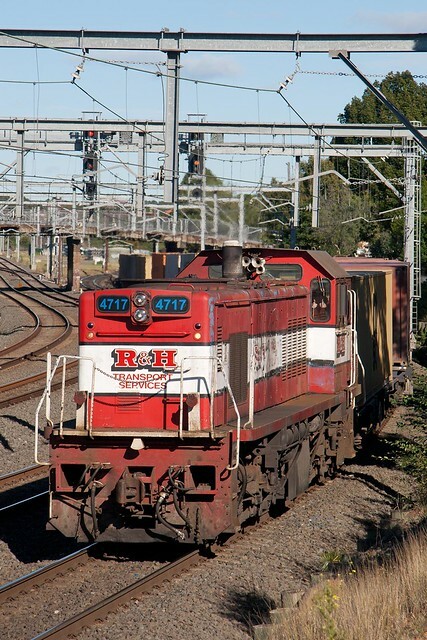 Eventually, the freight arm of LVR separated to form LVRF (Lachlan Valley Rail Freight), later known as Independent Railways of Australia (now based at Minto, near Campbelltown in Sydney’s south-west). Independent Rail own a single 47 Class locomotive (4717), and hire 4703 from LVR for use on metropolitan trip workings (although the locos are also occasionally used for regional container traffic, owing to failures and locomotive shortages). 4708, which was previously on hire to Independent Rail, is now undergoing a full overhaul by LVR at Cootamundra. 4707 was also used by Independent Rail at one point, although this locomotive is now stored at Cooks River waiting overhaul to be returned to service. Perhaps the best story for the 47 Class in commercial operation has been that of 4701, 4702 and 4716, all on lease to Southern Shorthaul Railroad (SSR) for Infrastructure train working (although the class did perform a brief stint banking SSR’s Newstan coal train in 2011). 4701 has been repainted into the SSR corporate livery for long term hire, while 4702 re-entered service in an LVR silver, green and red scheme. 4716 is painted in Indian Red livery. 4701 and 4716 had originally been used in heritage service with LVR, operating alongside their steam locomotive 3237, although this came to an end with the purchase of 4903 and 4906 from Asciano. It is likely that a condition of the sale precluded the locomotives from being used in commercial service, which has freed up the 47 Class for these duties. With 4708 destined for eventual service with SSR, it seems that the 47 Class are enjoying a second lease on life – what would have seemed an unlikely prospect in the 1990’s given their colourful career in government service. 4701 – LVR, on lease to SSR. SSR livery. 4702 – LVR, on lease to SSR. Silver/Green/Red livery. 4703 – LVR, on lease to IRA. Green/Yellow livery. 4704 – Scrapped at Simsmetal Kooragang Island, July 1990. 4705 – Preserved for static display at Werris Creek. 4706 – Stored at Dorrigo Steam Railway & Museum. 4707 – LVR, stored at Cooks River. SRA Candy livery. 4708 – LVR, under overhaul at Cootamundra. SRA Candy livery. 4709 – Scrapped at Cardiff, April 1979 (see above). 4710 – Scrapped at Cardiff, April 1979 (see above). 4712 – Scrapped at Simsmetal, Kooragang Island, July 1990. 4716 – LVR, on lease to SSR. NSWGR “Indian Red” livery. 4717 – IRA. R&H Transport Livery. 4718 – Scrapped, February 1992. 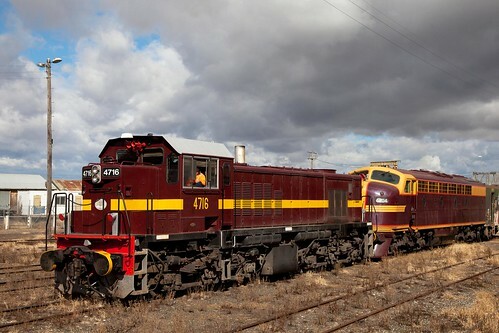 HTV2000 (4719) – LVR, stored Cowra. 4720 – Scrapped at Simsmetal, Kooragang Island, July 1990. Without wanting to re-write an entire article, any minor changes to the class will be documented here as they are found out (If I have missed anything, please feel free to add a comment below). 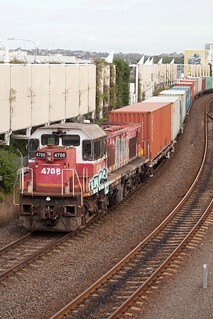 August, 2012 – 4703 and 4707 are transferred from Cooks River to Eveleigh, with both units being de-hired from Independent Rail (now owned by Qube Logistics). 4707 will be restored to running condition, while plans for 4703 are currently unknown. If Goodwin’s (Alco licensee) had still been in operation the 47’s may not have eventuated, instead another 20 48’s would probably have been preferred! Always an interesting looking and in early years an “elusive,” for me at least, loco to photograph.